Advertising has changed. Companies can no longer simply interrupt consumers with advertising messages and expect them to march off and buy something like little credit-card wielding lemmings. But ad tactics that reach out to customers when they’re already interested or that tell authentic stories are still an effective way to increase site traffic. Not that long ago companies made products targeted at the mass market, developed ads for the mass market, and encouraged the mass market to buy from, well, massive chain stores. But as the Internet has grown, it has created an almost unlimited number of ways for shoppers to get product information and develop particular product tastes and expectations, creating niche markets—think about all of the low-fat, low-carb, no-caffeine, extra-caffeine, organic, green, fair-trade products that have become available at your local grocery store. What’s more, consumers can more easily turn off promotional messages either actually—by switching channels, using a DVR, or blocking ads with a web browser—or intellectually—as they just ignore the hundreds of marketing messages they receive every day. The ability to simply ignore advertising has its roots in human psychology. Habituation is the gradual reduction of psychological or behavioral response over time as a person is repeatedly shown a particular stimulus. In laymen’s terms, it means that because Madison Avenue advertising agencies have been bombarding people with so many ads for so long. those ads essentially become muted—they are like background noise that consumers just tune out. Depending on who you ask, American consumers, as an example, are exposed to between 300 and 3,000 advertisements per day on average. In that hail of “Buy Now,” “Limited Time Offer,” and “New and Improved,” ads it is little wonder that humans have had to take psychological cover. Even the most modest estimates would translate into an ad every three minutes for every waking hour of the day. The ads that people ignore most are interruption ads. These ads seek to interject themselves into some other activity. Television commercials and some forms of radio advertising are the classic examples of interruptions. And any sort of an Internet road block ad falls into the category too. Unfortunately for those who trade in this sort of marketing, we are living in the post-interruption world. But there are other kinds of advertisements that I believe shoppers actually want to see and hear, and it is these forms of advertising that ecommerce businesses can use to increase website traffic. I divide these useful and effective ads into two rough categories, (1) ads that consumers are looking for, and (2) ads that tell authentic stories. According to a Search Engine Marketing Professional Organization study, 54 percent of marketers believe that pay-per-click (PPC) or paid placement ads are effective. And personally, I agree. PPC ads are one of the types of advertisements that consumers go looking for. Think about your own search behavior. If you’re searching for “new snowboarding jackets,” you will not ignore a PPC ad from Burton (a leading snowboarding brand) only to read a less specific description from Extremegear.com, the first organic listing in Google. Rather because you were actively looking for new snowboarding jackets, you turn off your no-ad filter, overcome habituation, and recognize the contextual value of both the ads and the organic listings. I am also a big fan of contextual video ads. Online video advertising is going to have a breakout year in 2009, and competition will be heavy. As an example, I know of a hunting gear retailer that is planning to use this sort of advertising in several online how-to videos. These videos will show consumers how to hunt various kinds of game animals. When the video shows a hunting scope being used, for example, the viewer can hover over the scope and see a text ad with a link back to the retailer. Shoppers are also looking for bargains. So placing coupons on nearly any web coupon aggregator is another example of advertising that consumers will seek out. Here is a short list of several tactics that I believe fall into this category. Pay-per-click. Because these ads show up in context, they are influential. Contextual video advertising. Again context is key, but more and more Internet users are downloading video. Coupon ads. Placed on coupon aggregators like RetailMeNot.com or FatWallet.com or placed in traditional print media, coupons are still the sort of ads that consumers crave, especially in a down economy. Catalogs. Consumers still use catalogs, flipping through the pages as they dream about future purchases. Demonstration or how-to video as advertising. Consider the success of Blendtec and its Will it Blend video series, when video advertising and video entertainment meet, customers will follow. 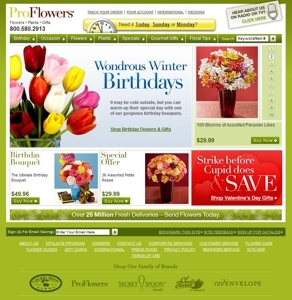 In December 2008, ProFlowers.com had one of the highest conversion rates in the ecommerce business, transforming 31.1 percent of all site visitors into paying customers, according to The Nielsen Company’s MegaView Online Retail study. So what is their secret? I believe that ProFlowers is so successful because its ads, particularly radio ads, tell such authentic or real stories. Endorsements. If you can afford to have a radio host endorse your store, you will see a boost in sales. Blogs. Telling your company’s story becomes a form of word-of-mouth marketing that will reach an audience that would sleep through a slick television ad. Buzz or promotional marketing. Consider offering free and exclusive discounts that spread by word-of-mouth. Print advertising that is based on a worldview, not a product. Print advertising can still be very effective, especially if the ad fits the context of the publication and adds to the publication’s theme or ethos. Interruption advertising is a fading tactic that is no longer as effective as it once was. But there are still lots of advertising tactics that will help ecommerce sites increase web traffic. PeC Traffic Report: Will 2009 Be the Year of the Coupon?